Bridge Collapse - Why Does It Continue To Happen? Bridges are impressive feats of modern engineering, seemingly so solid and strong that we often think of them as being permanent and impervious to time, wear, and the elements. Every time a bridge collapse occurs, we are reawakened to the fact that our nation’s most iconic structures need constant vigilance in the form of maintenance and attention. Bridge failures, although they happen in a moment, are rarely an instantaneous event. The sequence of events that sometimes lead to a bridge collapse often begins with improper design and construction. Maybe the engineer made a slight miscalculation regarding the proper mixture of cement or cable size. Maybe those responsible for building the bridge used inferior materials in order to save money on costs. Or maybe the bridge, originally designed to carry a small number of cars per day, is now required to carry many times that number without any reinforcement or reengineering. A small mistake during design, a material change during construction, or overuse over time might not cause a bridge collapse right away; however, such negligence inevitably leaves the bridge vulnerable to a failure at a sudden and seemingly random moment in time. Because the failure of these structures can be initiated by the smallest of issues, the problem can be very hard to detect, so there are safeguards put in place to keep bridge failures from happening. For example, inspections by government officials must be carried out frequently to ascertain whether or not the bridge is stable, secure, and not in any imminent danger from such insidious problems. And yet, even with federal regulations and inspections in place, many of our nation’s bridges are left with vulnerable weaknesses year after year, until a high-profile bridge collapse throws a spotlight on a persistent issue. Who is at Fault for Bridge Failures? While the negligent party may vary greatly from case to case, the people injured during a bridge collapse are almost never at fault. For example, when a natural disaster, such as an earthquake, causes a bridge to fail, it is sometimes the case that safety codes created specifically to keep these structures standing have been violated. Therefore, in many cases, when a bridge fails, someone may have neglected to do his or her job. When you are able, you should seek the help of a qualified legal professional. Our team of lawyers has the knowledge and experience to handle the complex technical aspects that lead to a bridge collapse. If you or someone you know has been harmed because of a bridge collapse, contact the experienced attorneys at Baum Hedlund for a free consultation. Baum, Hedlund, Aristei & Goldman handled its first bridge collapse case in 1989. Considered one of the worst 10 bridge collapse events in U.S. history, the Hatchie River bridge failure occurred near Covington, Tennessee on April 1, 1989 when an 85-foot section of the bridge fell into the rain-swollen Hatchie River due to rushing water weakening its bridge supports. Four passenger cars and a tractor-trailer rig plunged into the water, killing all occupants of the vehicles. In the aftermath, it was found that eight people had died during the bridge collapse. A federal investigation found that the river channel had moved 83 feet since the bridge was built in 1936, and that the bridge collapse likely happened as a result of the deterioration of timber piles that were originally buried and not designed to be in water. Baum Hedlund handled another bridge collapse that occurred just days later, on April 15, 1989 in Oliver Springs, Tennessee. A wooden bridge spanning the Southern Railway collapsed as a truck attempted to cross, leaving one man dead and two men injured. After the Hatchie River bridge collapse, Tennessee ordered that submerged bridge supports be inspected using divers every five years. At the national level, concerns grew deeper that the problem of aging bridges would increase with time and that bridge failures would increase. Federal law now requires the inspection of all bridges at least every two years, but state and federal enforcement of repairs is lacking. A cursory look at current bridge collapse news shows that those initial concerns have proven true. Bridge failures are on the rise because of an aging and fragile infrastructure. Bridges built more than 50 years ago remain in service despite years of neglect, allowing the damages that time wreaks upon such old structures to continue without inspection and repair. Federal programs created to inspect and maintain these structures are often understaffed, underfunded and unable to identify hazards and defects until after a bridge collapse has already happened. For example, the Mississippi River Bridge collapse that happened in Minneapolis, Minnesota on August 1st, 2007 was caused by a design flaw that allowed improperly sized gusset plates to be installed. As a result, flaws in the I-35W Mississippi River Bridge went undetected for 40 years until the weight of cars during rush hour traffic caused eight of the plates to fracture and tear. The resulting bridge collapse sent drivers and their vehicles plunging more than 100 feet into the Mississippi, killing 13 and injuring 145. The gusset plates specified in the bridge’s design were undersized and unable to properly support the weight of the bridge, a weight that only increased with time as more cars and trucks crossed the bridge every year, and as more cement was added to the roadway. This design flaw went unnoticed from the time of the bridge’s construction in the 1960’s to the date of its collapse, despite decades of repeated inspections, including one in 2003 during which an inspector even took a photograph that illustrated the gusset plates bowing under stress. Within days of the bridge collapse, inspections were increased across the country to look for similar design flaws. Sadly, such measures are too little, too late for those who tragically lost their lives that day. Another problem with our nation’s bridges is that many of the bridges have been changed, redesigned or altered in order to serve new and varied purposes. A serious lack of oversight and an inability to communicate among different safety departments, has proven to be a recipe for more bridge failures. This issue was at the heart of the bridge collapse over the Big Bayou Canot near Saraland, Alabama, on September 22, 1993. A barge pilot became disoriented in heavy fog and struck the partially unfinished railway bridge over the Big Bayou Canot, which caused the track to kink and move about three feet out of alignment. The bridge was left unfinished and improperly fastened so that the owners could install a swing bridge at a later date. While the damage caused by the barge did move the tracks, none of the rails were actually broken, so the track circuit did not register the problem and signal for the train to stop. When the Sunset Limited train reached the kink, it derailed. The speed and force of the train locomotive slamming into the gap in the rails caused a full bridge collapse that took the rest of the train down into the water. The locomotive’s fuel tanks ruptured and then exploded into flames, ending the lives of 47 people and injuring 103 people onboard. After the crash, the NTSB suggested that both barge companies and the U.S. Coast Guard needed to establish higher standards for licensing and competency. The NTSB also stated the need for a national risk assessment program to identify bridge failures that may arise due to collision damage from marine vessels. Our firm represented 22 passengers, including both injured and killed, in this bridge collapse. This bridge collapse highlighted a complete lack of communication and cooperation between three federal agencies tasked with safety oversight of the railroads, bridges and waterways. Proper communication and interdepartmental awareness could have prevented this bridge collapse and save many lives; however sometimes even proper communication and awareness of defects is not enough to prevent bridge failures. A tragic case exemplifying this issue was the Skagit River Bridge collapse on May 23, 2013 near Mount Vernon, Washington. An oversized load on a big rig truck hit a support beam while travelling on the bridge, causing part of the structure to fall into the water. Three people driving on the bridge at the time were also thrown into the water below, but, miraculously, no one was killed. The horrifying part of this story is that at the time of the collapse the almost 60 year-old bridge was listed in the National Bridge Inventory as “functionally obsolete,” meaning that the bridge’s aging design made it unsuitable for its current use. Therefore, the federal government was already alert to the fact that the Skagit River Bridge could not stand up to today’s traffic volume, speed, size or weight, but did not order the roadway to be closed. Even more egregiously, the bridge was also labeled as “fracture critical,” meaning that if any main structural member failed, it could put the entire bridge at risk. This is because there were no extra support structures built as fail-safes in the event one of the integral supports gave way. These types of designs were deemed unsafe and discontinued in the 1970s, yet bridges that were constructed prior to that date were left in use with no plans to make safety upgrades. These fracture critical designs leave large bridges extremely vulnerable to collapse during even the smallest of collisions with ships or larger trucks. Such collisions had been consistently reported as causing damage to the bridge since 1979. But despite these very obvious red-flags, the Skagit River Bridge was left unaltered, without so much as a warning sign for oversized vehicles crossing over at their own risk. 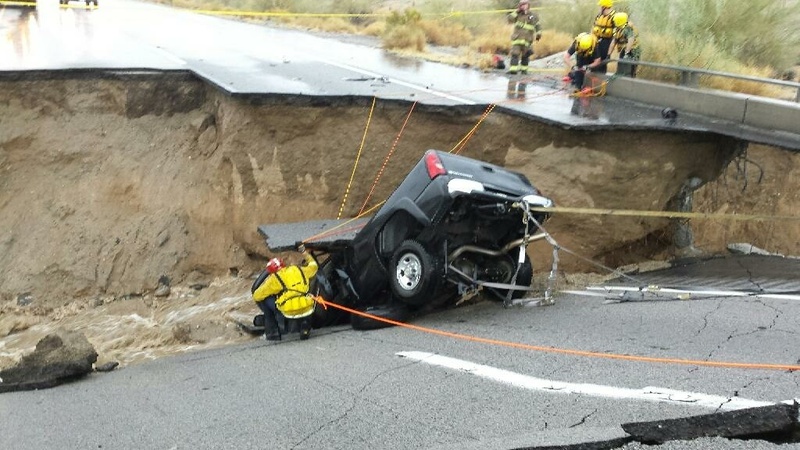 These same red flags came to light when the Tex Wash Bridge on the I-10 freeway near Desert Center collapsed during a flash flood after unusually heavy rain in California on July 19, 2015. One person was injured and hundreds of motorists were stranded after the east bound lanes gave way. This portion of the I-10, located in Caltrans District 8, is the main travel route between Phoenix and Los Angeles, with about 20,000 cars traveling on it every day, yet the nearly 50 year-old bridge was labeled “functionally obsolete” in the National Bridge Inventory last year. The bridge collapse occurred after flooding waters undermined its structure. However, even a completely unexpected natural event, like record breaking rain, must be taken into consideration when designing and maintaining a bridge. Much heavier rains hit bridges and roads across the U.S. year-round without causing bridge failures. This type of event speaks to poor design, maintenance, or government oversight. As you can see, there are many factors involved in a bridge collapse, but there is only one constant—these disasters should not occur under any circumstance and the parties at fault for allowing such events to occur need to be held accountable.